Come and spend time with Jesus for One Hour and say Thank you Jesus for all the many blessings you have given us. The Forty Hours Devotion is a special forty-hour period of continuous prayer made before the Blessed Sacrament in solemn exposition. The Forty Hours Devotion is a special 40-hour period of continuous prayer made before the Blessed Sacrament in solemn exposition. Of course, the focus of this devotion is on the Holy Eucharist. As Catholics, the words of our Lord burn in our hearts: "I myself am the living bread come down from Heaven. If anyone eats this bread, He shall live forever; the bread I will give is my flesh for the life of the world" (Jn 6:51). Affirming our belief in the real presence of our Lord in the Blessed Sacrament, the Vatican Council II taught that the Holy Eucharist is "the source and summit of the Christian life" ("Lumen Gentium," No. 11). While the Mass is the central act of worship for us Catholics, an act which participates in the eternal reality of our Lord?s passion, death and resurrection, Vatican Council II upheld and encouraged the adoration of the Blessed Sacrament outside of Mass. Of course such devotion derives from the sacrifice of the Mass and moves the faithful to both sacramental and spiritual communion with our Lord ("Eucharisticum Mysterium," No. 50). As Pope Pius XII taught in "Mediator Dei," "This practice of adoration has a valid and firm foundation." Our late Holy Father, Pope John Paul II, had repeatedly "highly recommended" public and private devotion of the Blessed Sacrament, including processions on the feast of Corpus Christi and the 40 Hours Devotion (cf. "Dominicae Cecae," No. 3, "Inaestimabile Donum," No. 20-22, and "Ecclesia de Eucharistia," No. 25). Second, the number 40 has always signified a sacred period of time: the rains during the time of Noah lasted 40 days and nights; the Jews wandered through the desert for 40 years, our Lord fasted and prayed for 40 days before beginning His public ministry. The Forty Hours Devotion remembers that traditional "40-hour period" from our Lord?s burial until the resurrection. Actually in the Middle Ages, the Blessed Sacrament was transferred to the repository, "the Easter Sepulcher," for this period of time to signify our Lord?s time in the tomb. The Forty Hours Devotion begins with a Solemn Mass of Exposition, which concludes with the exposition of the Blessed Sacrament and a procession. The Blessed Sacrament remains on the altar in a monstrance. During the next 40 hours, the faithful gather for personal or public prayer in adoration of our Lord. 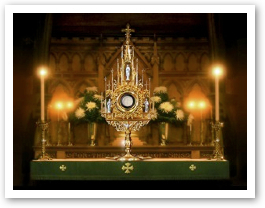 The Blessed Sacrament is reposed in the tabernacle for the daily Mass, and then returned for exposition after Mass. At the end of the devotions, the Mass of Reposition is offered, again concluding with a procession, benediction and final reposition of the Blessed Sacrament. While the 40-hour period should be continuous, some Churches break up the time, reposing the Blessed Sacrament at night because of security reasons. The Forty Hours Devotion can be seen almost like a parish mini-retreat or mission. A guest priest may be invited to give a series of homilies. Confessions should be offered and encouraged. Consequently, a most appropriate time to schedule Forty Hours is either Advent or Lent. While the Forty Hours Devotion nurtures the love of the faithful for our Lord in the Blessed Sacrament, three special dimensions have also surrounded this devotion: the protection from evil and temptation; reparation for our own sins and for the poor souls in purgatory; and deliverance from political, material or spiritual calamities. Here the faithful implore our Lord to pour forth His abundant graces not only for themselves, but their neighbors, not only for their own personal needs, but for those of the world. Such practices are evidenced in the history of this devotion, which we shall explore next. Having explored the spiritual dimension of the Forty Hours Devotion, a greater appreciation for this spiritual exercise is found through knowing its history. The practice of Forty Hours Devotion originated in Milan about the year1530. Granted, prior to this time, the Church did have exposition and benediction, Eucharistic processions, and devotions to the Blessed Sacrament reserved in the tabernacle. In 1539, Pope Paul III responded to a petition from the Archdiocese of Milan asking for an indulgence for the practice: "Since our beloved son the Vicar General of the Archbishop of Milan, at the prayer of the inhabitants of the said city, in order to appease the anger of God provoked by the offenses of Christians, and in order to bring to nought the efforts and machinations of the Turks who are pressing forward to the destruction of Christendom, amongst other pious practices, has established a round of prayers and supplications to be offered by day and night by all the faithful of Christ, before our Lord's Most Sacred Body, in all the churches of the said city, in such a manner that these prayers and supplication are made by the faithful themselves relieving each other in relays for forty hours continuously in each church in succession, according to the order determined by the Vicar... We approving in our Lord so pious an institution, grant and remit." While this pronouncement seems to be the earliest official approval by the Church of this devotion, the Forty Hours Devotion spread rapidly. By 1550, both St. Philip Neri and St. Ignatius Loyola had also instituted this practice, especially for the reparation of sin. Recognizing the tremendous graces offered through this devotion as well as the dangers threatening the Church, Pope Clement VIII in his letter Graves et diuturnae (November 25, 1592) proclaimed, "We have determined to establish publicly in this Mother City of Rome an uninterrupted course of prayer in such ways that in the different churches, on appointed days, there be observed the pious and salutary devotion of the Forty Hours, with such an arrangement of churches and times that, at every hour of the day and night, the whole year round the incense of prayer shall ascend without intermission before the face of the Lord." He also issued regulations for the devotions, which were later collected and promulgated by Pope Clement XI in 1705, and known as the Instructio Clementina. In our own country, St. John Neumann (1811-60), the fourth bishop of Philadelphia, was a strong promoter of the Forty Hours Devotion. While the practice had already existed in individual churches throughout the city (as well as in other places in the country), no organized, cohesive diocesan schedule for it had ever before been attempted. St. John had an tremendous devotion to our Lord in the Blessed Sacrament, and desired to foster such a spiritual life in his people. Unfortunately at this time, a strong anti-Catholic sentiment plagued Philadelphia. During the Know Nothing riots of 1844, two churches were burned and another was saved simply by the threat of gunfire. Some priests, therefore, advised St. John that the introduction of 40 Hours Devotion would only flame the hatred against the Catholics and expose the Blessed Sacrament to desecration. St. John was left in a quandary. A strange incident occurred which helped St. John decide. One night, he was working very late at his desk and fell asleep in his chair. The candle on the desk burnt down and charred some of the papers, but they were still readable. He awoke, surprised and thankful that a fire had not ignited. He fell on his knees to give thanks to God for protection, and heard His voice saying, "As the flames are burning here without consuming or injuring the writing, so shall I pour out my grace in the Blessed Sacrament without prejudice to My honor. Fear no profanation, therefore; hesitate no longer to carry out your design for my glory." He introduced the practice of 40 Hours Devotion at the first diocesan synod in April, 1853, and the first devotions began at St. Philip Neri Parish, an appropriate place since that saint had initiated the devotion in the city of Rome. St. John himself, spent most of the three days in the Church praying. No trouble ensued. St. John then introduced the program for the whole diocese, so that each parish would have Forty Hours Devotion during the course of the year. He composed a special booklet for the devotions and obtained special indulgences for the faithful attending them. The Forty Hours Devotion was so successful it spread to other dioceses. At the Plenary Council of Baltimore in 1866, the Forty Hours Devotion was approved for all Dioceses of the United States.